If you are a new author, beware of publishers who offer to publish your book. Also, be just as wary of publishers you discover that say a lot about publishing your book, but almost nothing about how much it will cost or how they will help you market and sell your book. There is a very big difference between vanity publishing and self-publishing. It is easy to self-publish today, and it is basically free. Sure, there are preparation costs involved in book cover design, editing and proofreading and print on demand proof copies, but the actual cost of publishing and distribution is absolutely free. It is worth remembering that self-publishing is not new at all. Mark Twain self-published. Importantly, for Indie authors you retain all the rights to your book and you are paid directly and usually monthly for your book sales by the retailers you choose to use. Despite this fact, many authors are still lured to seemingly attractive offers made by vanity publishing companies to do everything for them. But, at what cost, and to what benefit? What usually follows after an initial contact with a vanity publisher, or subsidy publisher is high-pressure selling that can last for weeks or months. When should you be suspicious about the business model of a vanity publisher? 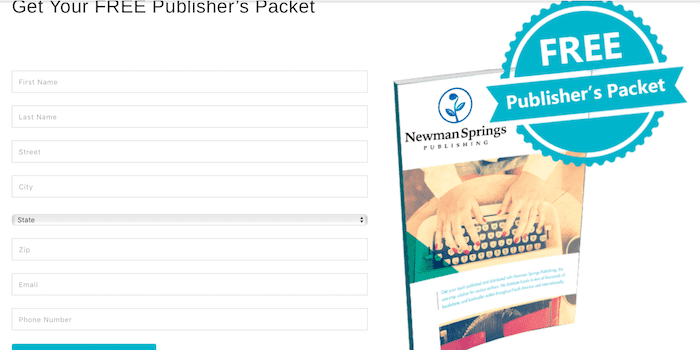 Because of this, here are my initial thoughts about Newman Springs Publishing. What are my thoughts about Newman Springs Publishing? I was prompted to write this article after I was contacted by an ex-employee of Author Solutions. While the person wants to remain anonymous due to pending legal action, I have permission to quote some passages. Many employees, current and former, are filing a law suit (sic) against Author Solutions. The attorney’s (sic) are collecting the narratives now, This is all we can release at this time, but we wish to bring the global community on board. We are currently working on press releases. Author Solutions (currently owned by Najafi Companies, a hedge fund) is not only a toxic place for writers, scamming many out of thousands of dollars, it is just as toxic on its employees. We wish to provide the global writing community with transparency as well as return our own integrity. I am sure you would be aware, but we cannot divulge our names at this time as our attorney’s (sic) have warned against it. The purpose for all of us contacting the publishing world (we know this world and many of us have been in it for over 20 years), we want the world and the authors to know what really is going on. Not only to the authors, but the debauchery that employees have to put up with is unfathomable. It only takes a quick Google search to discover that Authorhouse and Author Solutions have both attracted many complaints over the years about their business practices. There are many other publishers that you should avoid, or be very wary about. You can also check the list of vetted publishers and services for writers on The Alliance of Independent Authors site for more information. Vanity or subsidiary publishing is not always what it seems. If a publishing house is honest and open about what it does and how much it charges for its publishing and marketing services, then it could be of value for some authors. Vanity publishing in itself is not bad, but there are some bad actors who prey on unsuspecting new authors. Beware also of those who claim to be a literary agent and contact you directly with an offer to publish your book. Reputable literary agents would never do this, as they have more than enough pitches on their desks. There are four telltale signs of a vanity press publisher that might give you reasons for concern. 1. It only talks about edit, design and publishing your book and says nothing at all about how you or they plan to sell books. There is rarely a mention of historical sales, readers or book buyers. 2. It offers lots of expertise and experts in publishing your book but there are no names, bios or qualifications. 3. It offers you an absolutely free publishing guide as a way to get not only your email address but most importantly, your telephone number. This a classic vanity press ploy. 4. There is no mention of pricing packages, or if there is, it is extremely vague. I have received numerous emails and messages asking about one new publisher in particular. On top of that, one of our earlier articles warning about scam publishers has been attracting a lot of search traffic regarding this publisher. This is not a review. It is only a summary of my first impressions of what this publisher is offering on its website. 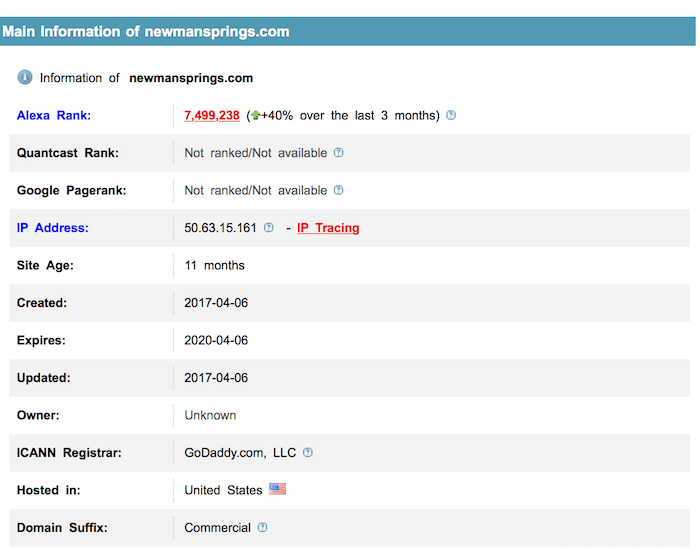 Newman Springs Publishing is a new company that seems to have been operating since April 2017. There is one troubling entry in the screen grab below of its site details. The owner’s name is hidden. There is also no mention of owners, directors, managers or even contact staff on its website. Also, when you visit the website, nothing happens when you click the About Page so there are no faces, names, qualifications or details about the company. Then there is the Free Publishers Packet. But before you can get it, the publisher wants your telephone number. This is the oldest and most commonly used approach of many vanity presses to get your personal details before you have had a chance to investigate what the company is really offering. My last stop on this website was published books. There are not many books. I could only find four. The button ‘Featured Books’ did not work, so I can only presume that these are the only four books that have been published. There was no mention of the number of copies sold. I would advise caution as the information on the website is lacking many details. There are all of the four telltale signs I mentioned above that should make any author be wary of this publishing offer. In particular, there is no mention at all of price or pricing packages. “If your manuscript is acceptable and meets our publishing criteria, we will publish it and bring it to the retail market for a relatively inexpensive initial investment. So how much is the inexpensive initial investment? What exactly are net sale proceeds? When are royalties paid? Monthly, or annually? What is a sort of partnership? There are no terms and conditions on the site, so it is impossible to answer these questions. As for marketing your book, it offers to do a press release, give you a webpage and post your book on Twitter and Facebook. That is not a lot of book marketing. It is worth considering its following on social media. It must be low, as there is neither a Facebook or Twitter link on the site. I managed to find the Facebook Page, with 899 Likes, but I couldn’t find a Twitter account. The offer of a press release is not that impressive as free press releases are very easy to do but highly ineffective unless you are a celebrity. Newspapers don’t get too excited about a new book press release from a little-known publisher and an unknown author. This sounds very good, but it certainly does not mean that bookstores will stock a book. It only means that bookstores can order a book if a customer requests it. It is the same as Kindle Direct Publishing (which has now incorporated Createspace) expanded distribution. Therefore, all the distribution channels mentioned are the same as what any self-publisher can access themselves for free. There is very little specific information supplied on the site, so it is difficult to say if this publisher is offering anything more than vanity publishing wrapped in what could be perceived as assisted self-publishing. There is no mention of how books are produced. So it is impossible to know if quality offset printing and binding are offered for trade books, or if paperbacks are only print on demand. It doesn’t seem to offer much more than what any self-publisher could do themselves. Due to all the very vague information that is supplied by the publisher, my advice would be to proceed with caution and ask for a lot more specific information before even considering its publishing services. Unlike traditional publishing houses who pay authors to publish a book, vanity presses want authors to pay to publish a book. The difference between vanity publishing and self-publishing is almost always about deciding which is better value for your money. Do you really want to spend four, five or even six thousand dollars or more to publish a book with a publisher who can’t promise you any sales from its print run? If so, what value will a vanity publisher bring to you that you can’t get by self-publishing and a little hard work? With self-publishing, you have the choice to pay only for the services you need. Quality professional book covers, copy editors and a little paid promotion might cost you hundreds of dollars. But it won’t cost you thousands of dollars. Before you decide on which publishing route you are going to take to publish your book, do your homework and research very carefully. But writer beware. While there are many honest publishers and small press, there are also a lot of sharks. What’s The Difference Between Amazon KDP and KDP Select? When I first published with IUniverse in 1999, it actually did push sales and I actually got paid royalties. This all stopped when ASI took over and the staff ended up in a call center in Cebu. Trafford went down the same awful road soon after. My biggest mistake was publishing with Author House, but at the time, they didn’t cost anything. But even though I actually sold several books, they refused to pay a royalty. They even charged me for my author’s copy! Literary agents won’t touch “unknown” authors with a 10 foot pole, so this is what we are left with. I have tried to contact several agents but not one bothered to respond. Too bad. I’;m good and I know I’m good. (yes I am bragging!). So what do we do? Who would YOU go with? They promise editing, layout, cover design, digital & physical distribution, 12 author copies, a “Publicity and Press Release”, and a web page on their site. No mention of even social media. I’m not an expert in the space, but IMHO $3400 from an author (and hidden until the end) is the worst kind of vanity press. Thanks for the info Amarsir. I’m sure some of our readers will take note of the details you give about how Vanity publishers operate. Hey, I actually published with Newman springs myself and I was very pleased with the results. It is true there are no promise of book sales. Why would there be? 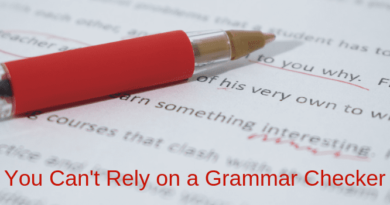 Are you a talented writer or not? A talented writer should not have to have a promise of book sales from a company to get the job done. If you have enough confidence to bring your work to the public all you can do is hope that you are good enough to gain results. You failed to mention one thing off their contract…That investment you pay is actually paid back to you in full off of the book sales prior to them receiving their royalties at all. So again, If your book is good and it sells then you really don’t pay anything. You will end up getting paid plus have all the help in the world getting the job done. Perfect for someone like me with 2 teenagers being a full time mom and employee. I have already published 3 books in a series with a self publishing company-Author House. I did not buy into their marketing scheme. What is the best way for me to market my books? So far I have used Facebook and word of mouth. Because my books are through Author House, they are priced as print on demand. The cost is $14.99 just to print,, making the retail price $22.99. What can I do to lower the cost of my books? I truly believe sales would improve with a lower retail price. Thank you for the information.I almost sent my book to Newman Springs. Good call on outing Newman Springs. I almost sent them the contract and killed myself at my job trying to get them the money. The “rep” did everything you warned us about when I talked to him. But the sad part is now I have to try getting my book to the public all over again. After 11 months with WestBow press, I severed my contract for a laundry list of reasons, not the least of which included an egregious failure to communicate adequately. The long and short of it is that it was a three-ring…mess. Thank God I’m out! I’ve just hired a project manager and editor and will self-publish, thank you very much. Glad to hear that you were fortunate to escape. Some authors are not so lucky. Thanks so much for your advice. I happened upon this page on accident. I published a gluten free cook book (released 2015) with my daughter. It took almost 3 years after signing a contract with Tate Publishing….it scared me enough that I was looking for an agent this time but it’s almost impossible. Most of them don’t answer back. I wish we had seen this page before signing a contract with Tate. They are now out of business: they stole our up front money ($4,000) and kept all our royalties…along with a bunch of other authors’ money. My daughter in law read all the reviews on them (and believe me: there were MANY) and warned us but we were proud of our work! Luckily, they’re in prison now. But how to find an agent or in an agent feasible? Honestly you would be better off working with this company! they do everything for you and unlike places like create space you are listed everywhere not just on amazon. If you do your research you’ll see that to do everything properly it will roughly cost around 10k. So companies like this Not only save you time and energy. They do things the regular average Joe can not. I published with Newmansprings. It was a smooth process. They were up front about what they would do and the cost. My only complaint is their dashboard. I tried to get on it many times, with just about all browsers ever invented. I could not get on. I have a fantasy novel in process at Dorrance Publishing and it will be published under Rosedog. I hope I’m safe from problems. True, it’s a vanity press, but I’m not technical enough to keep up with the KDP process. They didn’t charge much, $900 and promise to distribute through a variety of houses including Amazon Kindle. My hope is that once I’m published I might be in a better position to secure an agent. Am I right about that? So far Dorrance is doing everything they promised. How is it going with Dorrance? I have a novel I’d like to publish but I’ve no idea how to begin. They have my manuscript. They want ,$2,000 to begin editing which I’ll never raise. My fear is I don’t know how to copyright, and before I was told my cost, I was assured they would do it. Since $5,000 is out of my reach, what should I do? Has anyone checked out the newer, Ghostbookwriting “self-publishing company? Vanity press or legit? If you book prints for $14.99 and sells for $22.99 and retail store takes 40% of the $22.99 it leaves you with $13.79 but you print copy cost $14.99. Figure that one out for me because that’s the kind of boat I’m in.